Dog-proof raccoon traps are gaining recognition and acceptance, but the idea has been around for a long time. As early as 1897, a wooden cone trap that worked on this monkey-paw principle was offered for sale in America (featured in the December 2007 Antique Trap Collecting column). Designs vary, but all catch a raccoon when it reaches in through a small opening to get at a bait and its paw becomes trapped inside some type of enclosure. The traps are dog-proof because a dog will not and in most cases cannot insert its larger paw in through the small opening. The traps are also considered more humane because the animal cannot chew on the numb portion of the paw that is being held below the trap jaws, a particular problem with raccoons. 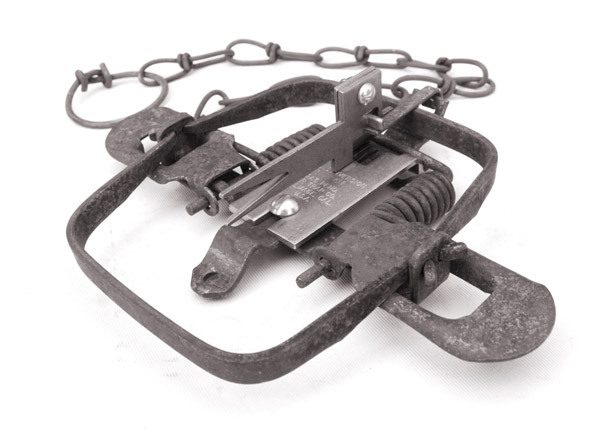 There are no less than a dozen different enclosed, dog-proof traps on the market today, but the DP Trap Company, Talmage, California, is most often credited with the first modern version. 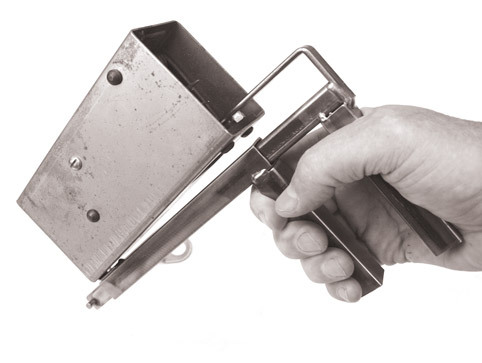 Jack Isborn, California trapper and inventor, began selling what he called the “DP Conversion Kit - Lift Up Trigger” sometime in 1982. The kit made an existing No. 1-1/2 or No. 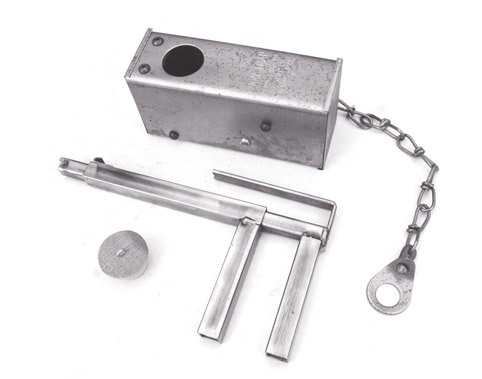 2 coilspring trap dog-proof by replacing the standard pan and trigger with a forked trigger that fired when lifted, not when depressed like the standard pan. To make a dog-proof set, the trap was set in a bed dug deeply enough to bury the entire trap (approximately 3-1/2 inches). Bait was impaled on the forked trigger. A foot-square piece of plywood with a 1-1/4-inch diameter round hole in the center was then placed over the set trap, with the hole directly over the forked trigger. A plug went in the hole, and the trapper then covered the plywood with dirt, sod, or whatever else was natural to the location. When the plug was pulled, a perfectly round, baited “dirthole” set was produced. When a raccoon reached in and pulled up on the baited trigger, the coilspring trap fired, catching the animal’s paw. Opossums, skunks and sometimes an occasional grey fox might also be caught. To avoid house cats, a sweet bait like peanut butter, honey or grape jelly could be used, as cats are not fond of such sweets. In 1984, Isborn patented a fully enclosed rectangular 16-gauge metal version. It came with a wood setting plug, sold for $11.95, and carried a two-year warranty. Metal end caps were removed to bait and set the trap. A special setting tool was offered for $6.95. It was recommended that the entire trap be staked and buried, leaving just the round opening for the raccoon to reach in through. Isborn passed away, but Mrs. Isborn renewed the patent for the trap in 1989 and then sold the company to Harry Winters, Willits, California. Harry sold the DP trap through 2005. The trap is now owned by another company but is not being actively promoted. Collector value for the trigger kit is $10-$15, for the DP trap $25.